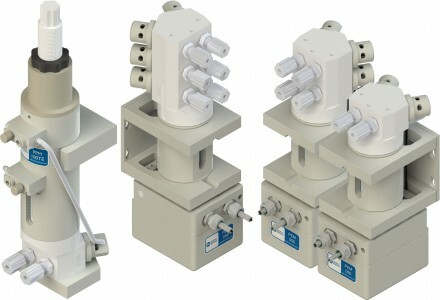 Metering pumps offer adjustable flow rates for use in single-wafer processing tools or premix vessels to ensure exact chemistry mixtures, and allow for in-situ mixing directly at the head. They accurately dispense high-purity chemicals for replenishing, blending, dosing and spiking applications. They are ideal for photoresist, etch and clean processes. PHC40 high-pressure pump offers up to 40 bar (580 psi) liquid discharge pressures. It dispenses up to 60 ml per minute. They feature metal-free flow paths to prevent ionic contamination. They are capable of receiving up to 7 Bar (100 psi) air supply pressures. 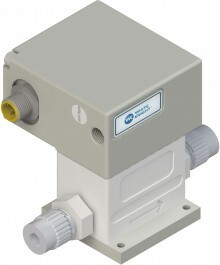 PPMC mini pumps are capable of up to 300 ml/min flow rates and 160 psi discharge pressures. They feature Teflon® PTFE and PFA fluid paths, and spring-loaded checks enable the pump to mount in any direction. 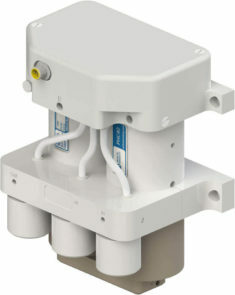 Solenoid valves actuate each suction and dispense. *Suction lift diminishes over time. Recommended installation level less than 4.6 m (15 ft.) above source. **Optimized parameters can improve repeatability. Minimize suction lift to maximize repeatability. Contact White Knight for details. Tests conducted with water at ambient temperature. Dispense range measured at full stroke with maximum and minimum supply pressures at 80 PSI and 60 PSI.